Awesome !! At what point does the state become responsible for not complying with court orders ? When someone actually sues the state. These lawsuits are against municipal police chiefs. Are we waiting for someone with frb relief who has never possessed guns still for that ?? No, you're thinking of the federal lawsuit. That comes after the state gets sued and forced to issue licenses to those with FLRB relief. And my bet is theyre waiting until they have as many restoration rulings from district courts as possible before they sue the state. It's a long road ahead. Any idea How many wins do the other guys have ? What’s our total ? And remember, we need to win every time. They only need to win once. Thank you Boston 4567 and knuckle drawer as always for the updates ! Greatly appreciated ! Is sports betting federally prohibited ? any State offense classified by the laws of the State as a misdemeanor and punishable by a term of imprisonment of two years or less. You are eligible to expunge a misdemeanor five (5) years after the successful completion of your sentence and/or probation. I hope so.. this is what ive been banking on in court if the federales come after me. The way it reads to me is that since my restoration.. im no longer considered convicted? My chief has decided to stay outta court and let the state deal with it so i have 4 years left until my ltc expires so im still legal.. yet not.. yet am. Do i carry? If something happens do i stick around? I dont have the gripe of saying i spent thousands to get this done.. i did this myself.. with no lawyer.. only cost me a ride to chelsea and a lot of running around for court and police records which is no easy task. I Sat in front of the board alone and plead my case and won.. but now I didn’t? Well i did according to all written law that ive found in my research.. maybe im missing something. I do understand that allowing a fid without the flrb relief which i did have (and still do) before i decided to go before the flrb board does violate federal law.. but i can’t see how im doing that now. Im sure they’ll explain it to me. So fkn frustrating !!! I have done all the above !! But I’ve spent thousands ! I even went threw the hearing alone. And now it’s all been flushed at the federal level ! Don’t Cary jerbal. I’m sure the chief has suspended your ltc already. Live to fight another day ! The way it reads to me is that since my restoration.. im no longer considered convicted? 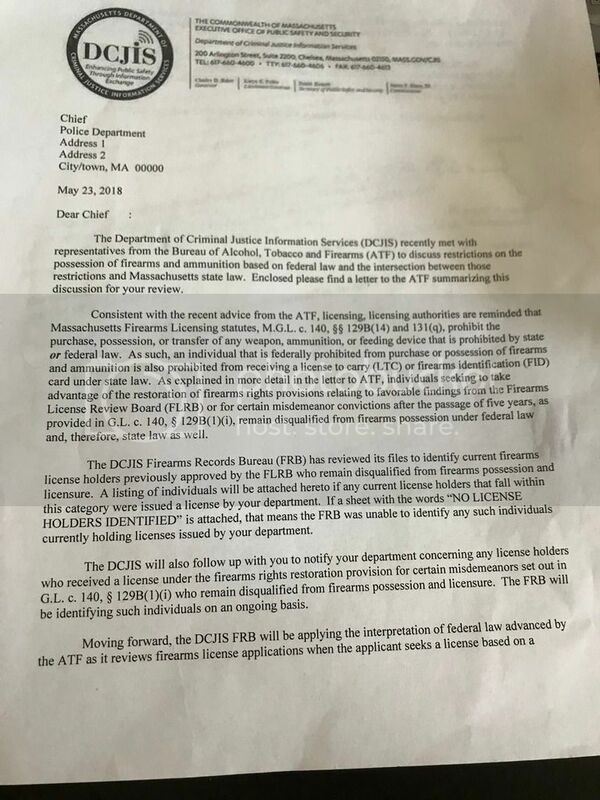 Your rights have been restored by the frb and you didn’t get the suspension letter in the mail about 6-7 months ago from the dcpartment of criminal history ? Not all police chiefs fell in line with the FRB directive and the FRB doesn't have the statutory authority to revoke a license or order a police chief to revoke a license. Many are taking a wait-and-see posture. KMM696, EJFudd, amm5061 and 3 others like this. Mind if I ask what town you live in jerbal ? apparently not all chiefs/departments have to act upon receipt of this letter. that the state will not return or process the revoked, application. we need all the names of the 341 people affected strength lies in numbers. eight judgements apparently are not enough. printed one page copies of the Globe Article stash in thousands of wiper blades all over Boston. "Governor Charles Baker ignores Court Orders"
I agree.. im in on that. I’m down ! Send me a bunch of flyers !! So the wins that we have already, are they the first 10 people represented by lawyers and comm2a ? Are they going to do 10 at a time like that ? Win #10 came in today against Foxborough, courtesy of attorney Keith Langer. Squib308, M1911, EJFudd and 11 others like this. Awesome mr langer! 330 more ! WOO HOO CRY HAVOC AND LET SLIP THE DOGS OF WAR ! A side benefit of this is that is it becoming less unthinkable for a MA court to rule in our favor. cma, Waher and HorizontalHunter like this. Are you going threw this also mr boudrie ? M1911, JRT, BarnB and 7 others like this.